Your teeth are meant to last a lifetime. Even with wear and tear from years of eating and biting they can continue to function properly and look attractive well into your senior years. Teeth are resilient thanks in part to enamel, the hardest substance in the human body. But the gums also contribute to this resilience: besides attractively framing the teeth, they protect the dentin and roots below the enamel covering. Unfortunately, the gums can shrink back or “recede” from their normal place. 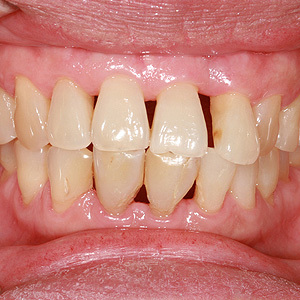 Not only does this look unattractive, the recession can also expose teeth to disease and cause tooth sensitivity to temperature changes or biting pressure. There are a number of causes for gum recession, some of which you may have little control over. If, for example, your teeth come in off center from their bony housing, the gum tissues may not develop around them properly. You might also have inherited a thinner type of gum tissue from your parents: thinner tissues are more delicate and susceptible to recession. But there are other causes for which you have more control. Over-aggressive brushing (too hard for too long), ironically, does more harm than good as it can injure your gums and cause them to recede. More likely, though, your recession is a direct result of neglecting proper hygiene for your teeth and gums. When teeth aren't properly cleaned through daily brushing and flossing, a thin film of bacteria and food remnant called plaque builds up on tooth surfaces. This can trigger periodontal (gum) disease, which subsequently causes the gum tissues to detach from the teeth and often recede. To reduce your risk of gum disease, you should gently but thoroughly brush and floss daily, and visit us for cleanings and checkups at least twice a year. If you have a poor bite (malocclusion), consider orthodontic treatment: malocclusions make it easier for plaque to accumulate and harder to remove. Above all, if you begin to see signs of gum problems — swelling, bleeding or pain — see us promptly for an examination and treatment. Dealing with these issues early is the best way to ensure your gums continue to do their jobs for the long-term. If you would like more information on the treatment and prevention of gum disease, please contact us or schedule an appointment for a consultation.